One of my all time favorite things is banana bread- I love the sweet banana flavor, the softness of the bread, and the way it feels so dessertlike. So, what about that same thing transformed into a bar? 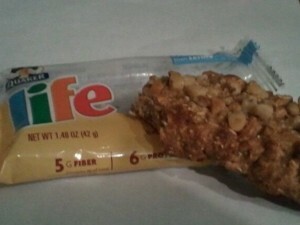 Quaker makes a Life Banana Walnut Bread Bar, that has pretty good ingredients, and according to the package, “5 grams of fiber, 6 grams of protein” and “20% of 5 B Vitamins”. Sounds pretty yummy to me! I saw on the front of the bar’s package to “try HEATING, then EATING”, and took the advice. I opened up the package, and was greeted with a rather strong and sweet banana aroma. Then, into the microwave this bar went for about 10 seconds. The result was a soft and chewy bar, that wasn’t super dense. On top remained a good amount of crunchy and flavorful pieces of walnuts.The banana flavor was delicious- not a fake banana flavor, but sweet like freeze dried bananas (which makes sense, since there is “freeze dried bananas” listed on the ingredients). This bar was actually very sweet, but very good, and did actually remind me of like a store-bought banana muffin, or a sweet version of homemade banana bread. 1 bar is 150 calories, 4 grams of fat, 26 grams of carbohydrates, 5 grams of fiber, 10 grams of sugar and 5 grams of protein. I normally always have cold cereal with fruit and almond milk for breakfast, but in the mood for something new, I wanted oatmeal. I didn’t want old fashioned oatmeal as I wanted to go to the gym after breakfast and I find old fashioned is much more satisfying than instant, and I kind of wanted some quick energy. 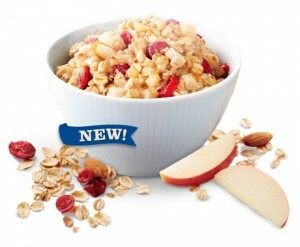 So, I decided to try the new Quaker Hearty Medleys Apple Cranberry Almond Instant Oatmeal. I believe I got a free sample that came with my daily newspaper, so I thought why not? I decided to do the microwave method, which required putting the oatmeal in a bowl with 1/3 of a cup water or milk and microwaving for 30-60 seconds, give or take. I remember thinking only 1/3 of a cup? it seemed kind of low, but I followed the instructions. After cooking, I noticed I probably could have added more water, as it was a little pasty in consistency. As for the fruit and nuts, the package claimed it was “loaded with real fruits & nuts”, so I was a bit skeptical, but quite pleased. While there weren’t a ton of apples and cranberries (in fact, I really didn’t find that many apples, but the cranberries were delicious! ), but there were a good amount of sliced almonds. They had a weird texture, not crunchy, but not soft, sort of an inbetween, like a chewy texture. Nonetheless, they were still good. It was different than any oatmeal I ever had. There also was a nice touch of cinnamon that provided good flavor. Overall, 3 1/2. It was pretty yummy, but the portion was kind of tiny, and the texture was a bit pasty. Perhaps if I ever buy this I’ll add more water, or use the stovetop( boiling the water )method instead. But, what I did like, was that I had this oatmeal with some fruit, and it was rather satisfying and provided me with the energy I needed! 1 pouch (36 grams) is 130 calories, 2.5 grams of fat, 27 grams of carbohydrates, 3 grams of fiber, 11 grams of sugar and 3 grams of protein.